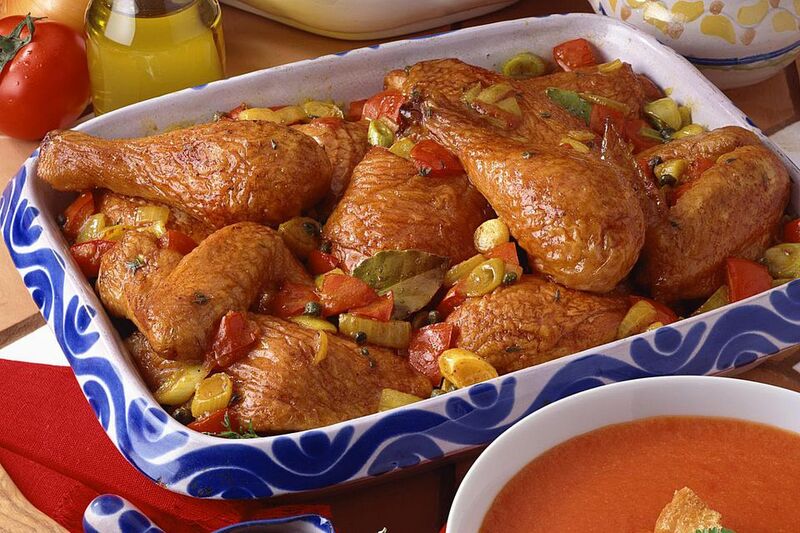 This excellent dish of Spanish Crockpot Chicken is easy to make and has lots of delicious flavor. Use kalamata or other more exotic olives for a more intense olive taste. The combination of sausages, onion, garlic, artichokes, and olives add fabulous flavor to plain old chicken. This recipe is easy enough to make on a weeknight and special enough to serve to company. All you need to serve with it is a nice green salad tossed with a ranch salad dressing, some steamed asparagus or green beans, and some toasted garlic bread. Enjoy every bite. In a large saucepan, cook the sausage until it is browned, turning occasionally so it cooks evenly. Remove sausage to paper towels to drain. Drain the saucepan, but do not wipe out. Add the onion and garlic to the drippings in the pan; cook and stir for 5 to 6 minutes until tender. In a 4 quart crockpot, mix all of the ingredients except for the bell peppers, artichoke hearts, olives, Italian seasoning, pepper, and almonds. Cover the crockpot and cook on low for 6 to 8 hours or until the chicken is thoroughly cooked to 165°F as tested with a food thermometer. Add the bell peppers, artichoke hearts, olives, and Italian seasoning to the slow cooker, and cook for 20 to 30 minutes longer on high. Sprinkle everything with the toasted almonds and serve with hot cooked noodles, mashed potatoes, or rice.